402-801 Open and Distance Learning - New Opportunities in Education System. Multi-layer Roulette. 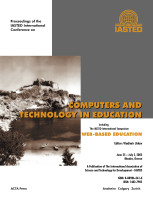 The topics covered in this publication include: studies on teaching and learning technologies and processes for WBE; human resources issues of technology – based education; studies in web-based education; quality issues, testing, and assessment; communication technologies; software systems and tools for WBE: authoring tools; software systems for WBE: developing learning objects; applications of multimedia technologies; software systems for WBE: agent-based technology; web services for WBE; technology-based education: best practices; collaborative learning; studies in open and distance education; software systems and tools for WBE; design and development of online courseware; virtual reality and virtual scientific labs; and studies of teaching and learning technologies and processes.